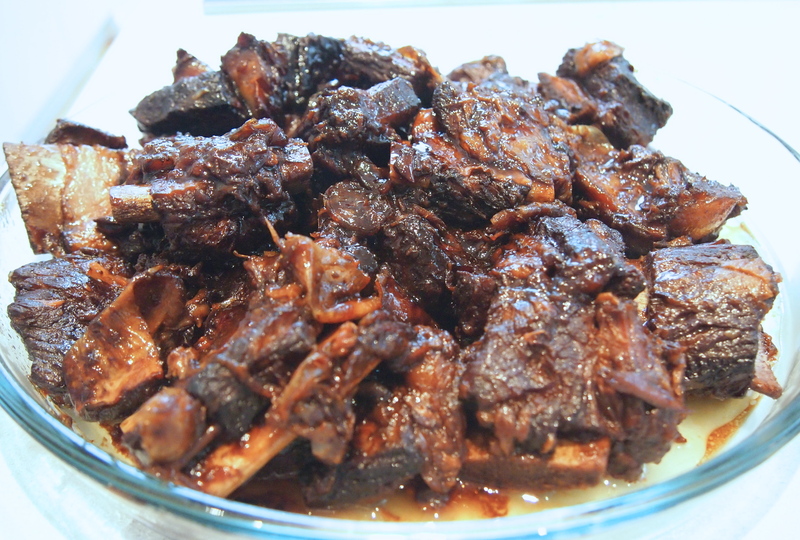 Beef short ribs are a wonderful cut for long slow braising and up until now the main way I’ve cooked them is in a standard braise of red wine along with the usual vegetable suspects of carrots, onions and tomatoes – totally delicious and wonderful paired with pasta, polenta or mash. 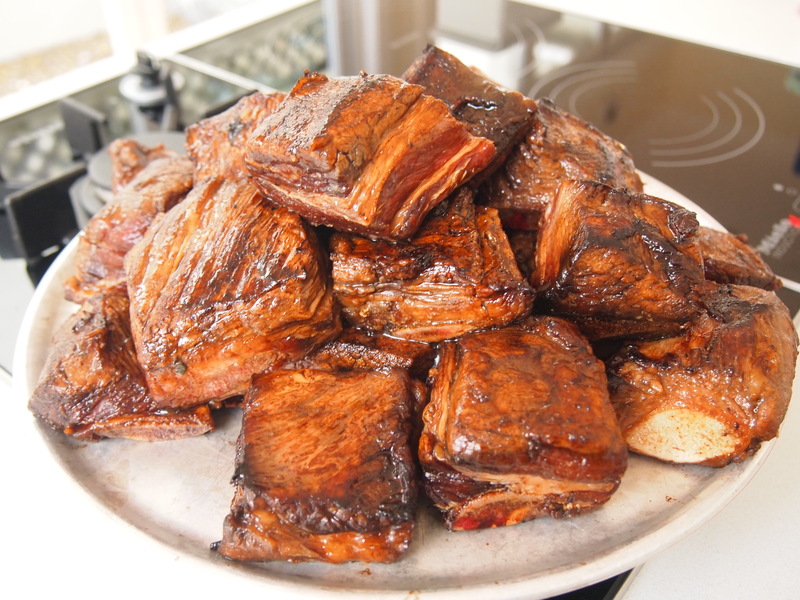 But beef ribs are also a popular cut in Asian dishes, some of which aren’t slow cooked, like Korean grilled beef ribs (kalbi), where the marinated ribs are cut thinly across the grain so all that’s required is a quick blast on the grill to yield tender ribs. In this Asian inspired recipe however the ribs are slowly braised in a wonderful aromatic broth of soy, star anise and dark wheat beer. The beer lending a wonderful earthy aroma to the dish. I couldn’t find dark wheat beer so I substituted half light wheat beer and half dark stout. I cooked the ribs long enough for them to be falling off the bone which makes for amazing flavour but you do compromise a little in presentation. If you can find a butcher that will cut your ribs in longer lengths this would be better but the smaller lengths that I could find made it hard to serve the ribs intact and on the bone. I served this as part of an Asian dinner with plenty of steamed rice to soak up the juices – it was a totally delicious, lip smacking meal and the recipe will definitely be going in my make-again file! 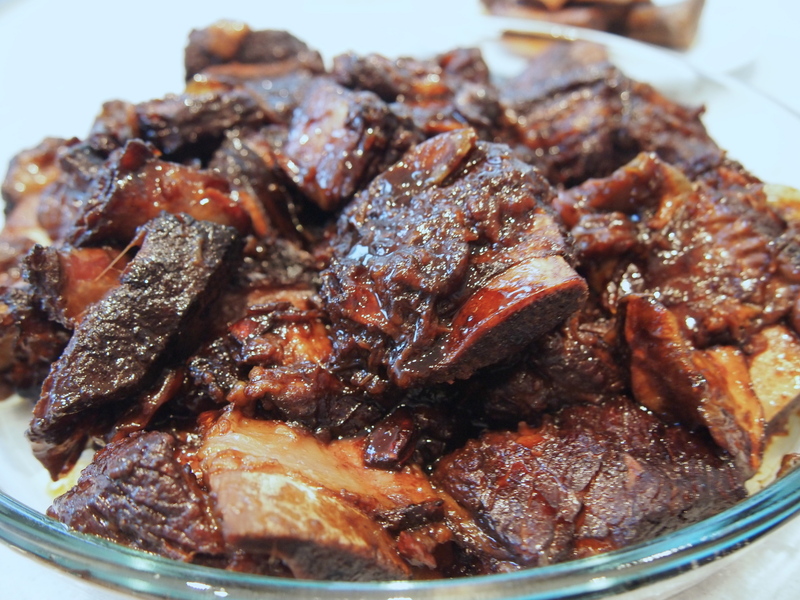 Place the beef and dark soy in a non-reactive dish and marinate covered in the fridge for at least 30 minutes, or overnight if you can. 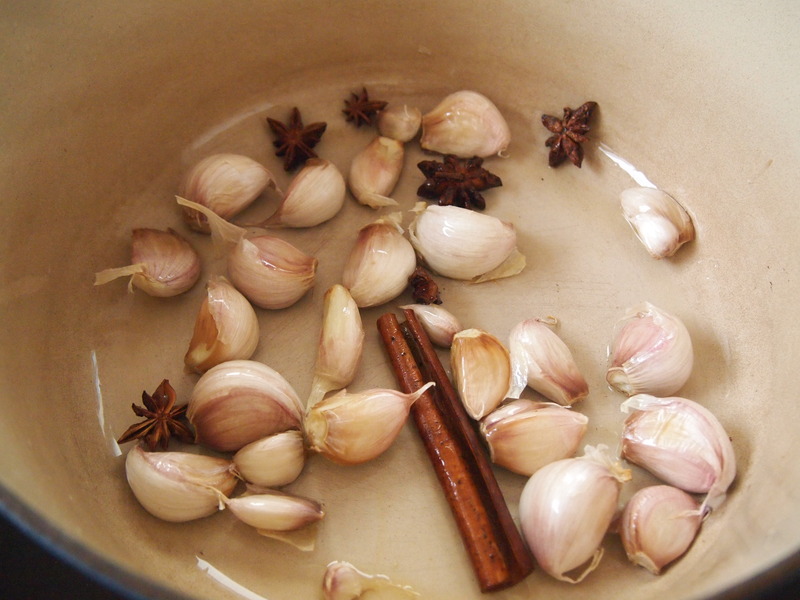 Heat the oil in a deep heavy-based saucepan over a medium heat and fry the garlic for 1 minute. Add the cinnamon and star anise and fry for another minute. Remove the garlic and spices from the pan and set aside. Add the beef and brown on all sides, you want a high level of caramelisation and you may need to do this in a couple of batches. When all the ribs are browned, return the garlic and spices to the pan and add the light soy, sugar and beer. Stir until the sugar is dissolved. Reduce the heat to low and simmer very gently for 30 minutes uncovered, stirring occasionally. Cover and simmer for a further 3 hours or until the meat is literally meat falling off the bone. 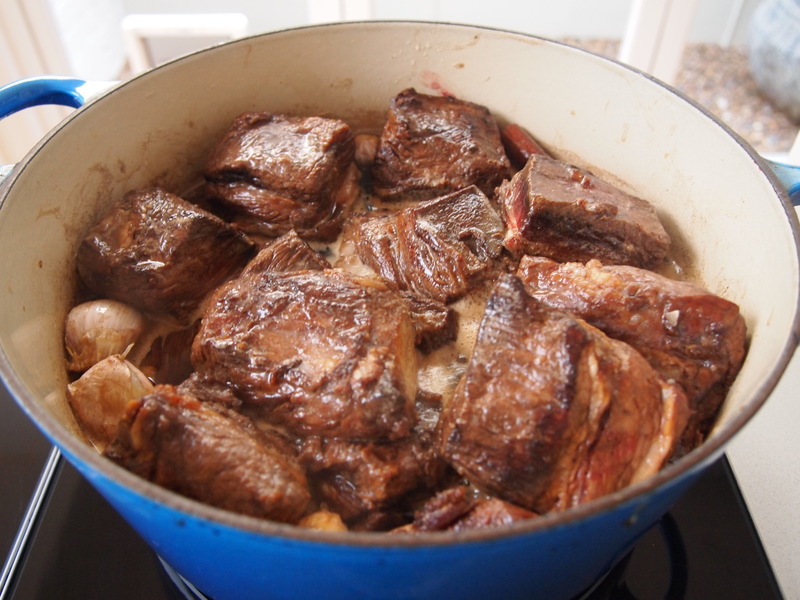 Remove the beef from the pan carefully with a slotted spoon, aiming to keep the pieces intact and simmer the cooking liquid over high heat until reduced and thickened. Return the beef to the pan and heat through. Serve with the garlic cloves, drizzled with sauce and steamed jasmine rice on the side. I am making this tonight in my rice cooker…to my husband’s dismay I shall use one of his coveted dark wheat beers (from Ikea…the cheapest place to get dark beer in China;). Can’t wait! Hi Christine, Thanks for your comment and I hope you enjoy the ribs – they really are delicious and hopefully once your husband tastes it he won’t mind sacrificing his beer!